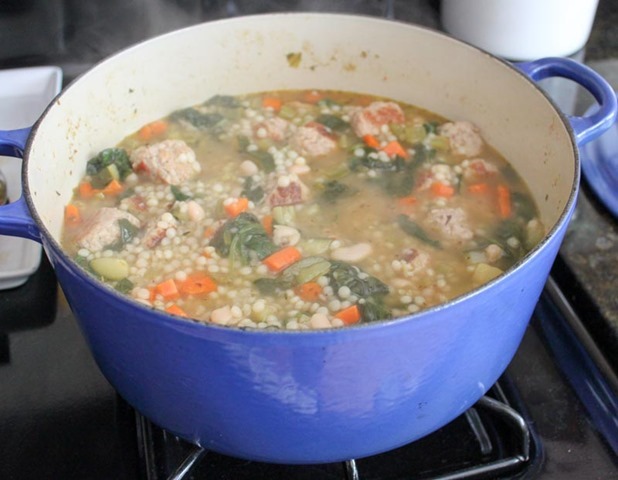 Did you know that Italian Wedding Soup has nothing to do with weddings? Nope, it’s only called this because of a translation snafu! 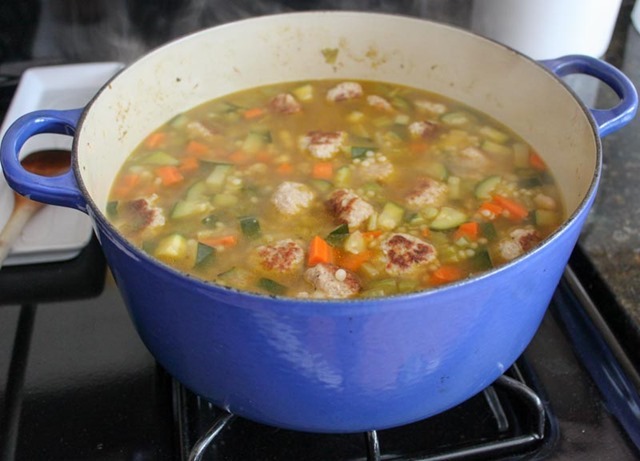 The Italian language phrase minestra maritata (“married soup”) is actually a reference to how well green vegetables and meat pair together (or marry) in recipes, not actually to something served at a wedding. I love the etymology of food; it’s so fascinating. 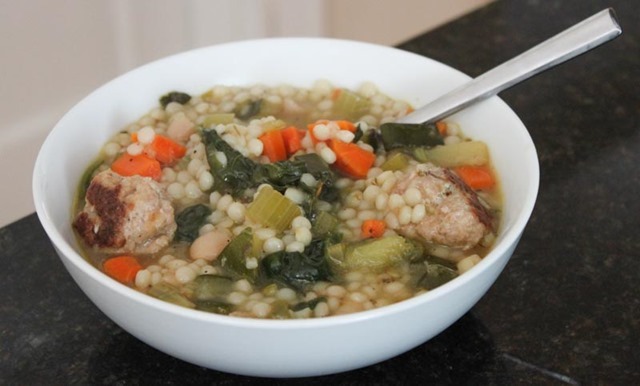 Despite being a pasty Irish gal and only Italian by marriage, I was struck with a desire for Italian Wedding Soup on our first chilly weekend. I didn’t have a recipe to go by but simply made this one up. Enjoy! Start by making the couscous just as you would any pasta – boil in salted water until al dente. Once cooked, set aside so that it is ready when you need it. Next, make the meatballs. 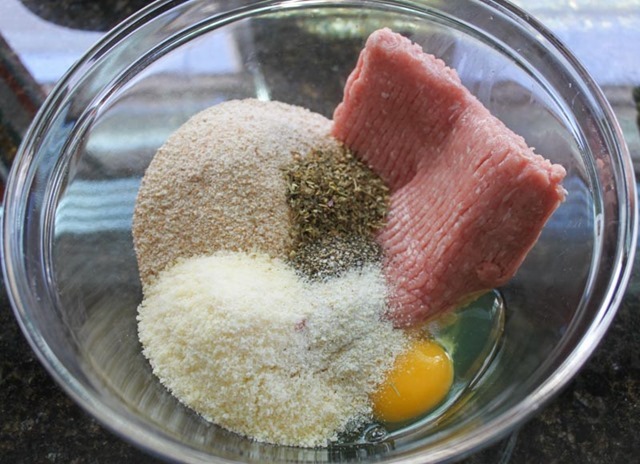 Combine all of the meatball ingredients in a big bowl and mix until thoroughly combined. Your hands are the best tools for this job! 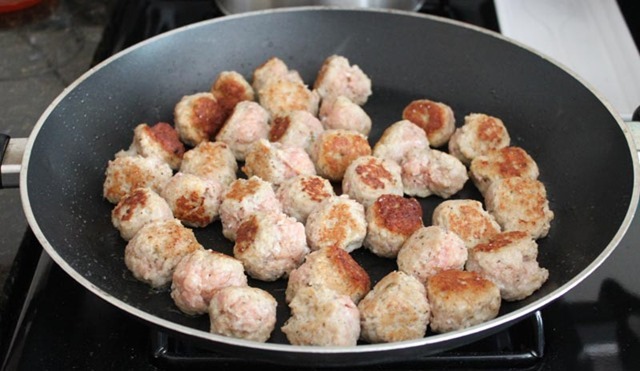 Once mixed, form small, 1 inch meatballs and set aside. Over medium-high heat, saute the meatballs in 1 tbsp. of EVOO until browned. For me, this took about 7-10 minutes. 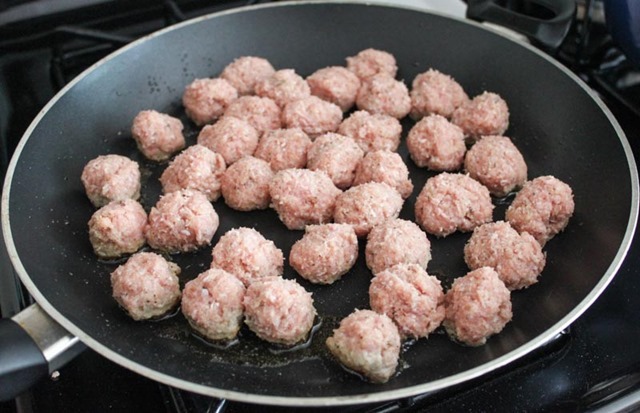 Don’t worry if the meatballs aren’t fully cooked on the inside, they will finish cooking later when you add them to the soup pot. When the couscous and meatballs are done, it’s time to start building the soup. Over high heat, saute the vegetables and 1 tbsp. 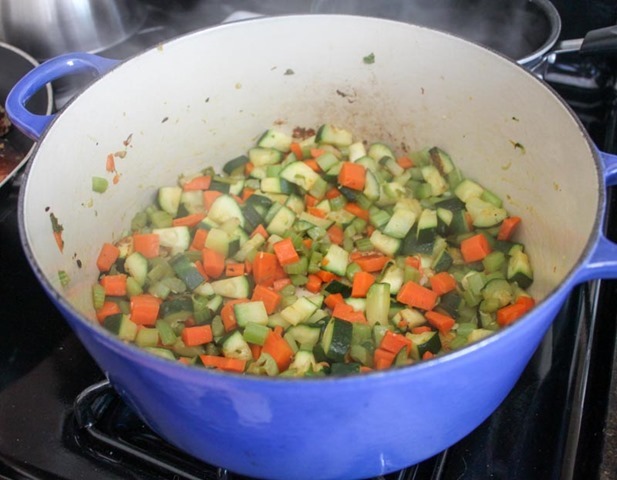 of EVOO in a deep soup pot (I love my Le Creuset for all soups!). 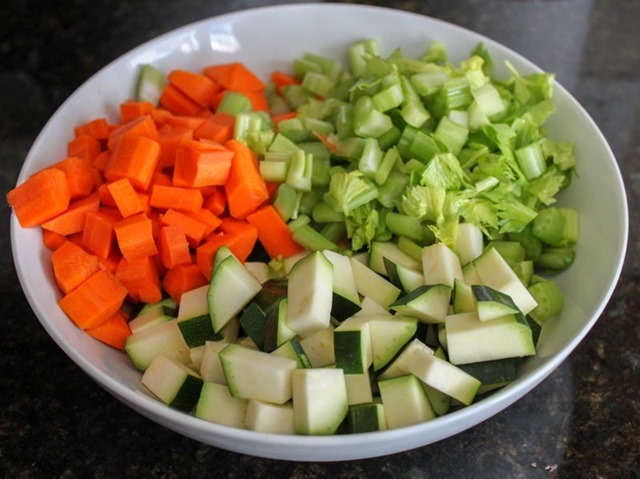 Cook until the veggies are soft and lightly brown. This took 10-12 minutes for me. 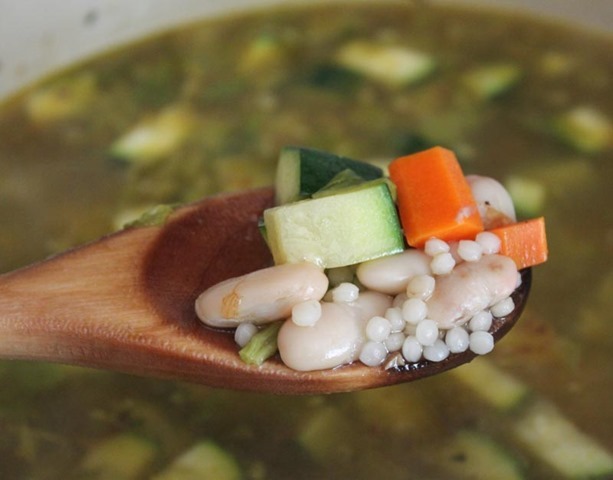 When the veggies are cooked, add in the chicken stock, beans, cooked couscous, and seasonings. Leave the heat on high, cover, and cook until a rolling boil forms. When the soup has come to a rolling boil, add the meatballs. Also, add the spinach on the top and cover again. 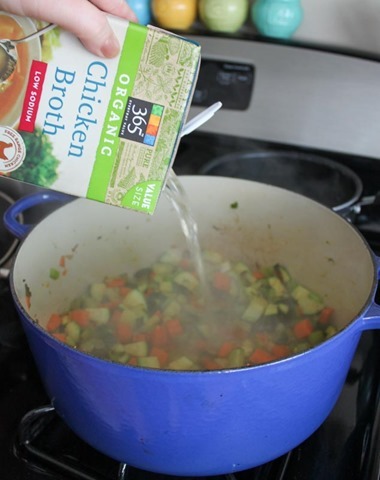 Reduce the heat to medium-low and simmer for 30 minutes. 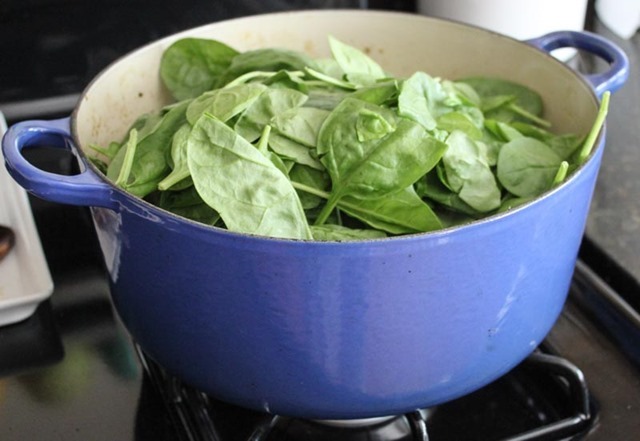 After 30 minutes the spinach will have fully wilted, the couscous will have thickened the soup, and the meatballs will be fully cooked. Taste and adjust for seasonings. At this point the soup is ready to eat! You can leave it simmering, covered, for up to 1-2 more hours. You can also portion and store in the fridge for meals during the week (which is what I did). The soup will keep for 1 week in an airtight tupperware container in whatever portion you like. A word about storing the soup – I portioned my batch into five containers for lunches during the work week. I found that the couscous absorbed most of the chicken stock after 12 hours in the fridge. Next time I would keep the soup and couscous separate, and mix together right before eating. But if you are eating directly from the pot, you will be golden! This soup is earthy, packed with flavor, full of rich veggies, and surprisingly filling. The mini meatballs add the perfect surprise flavor punch as well. I can’t wait to make this recipe all winter long – it’s definitely a keeper! This looks amazing!! I might have to try to cook it up in my teensy kitchen soon, it’s getting colder here and I am not ready for it! You might also like this recipe, with orzo and a nice lemon tang. One of my favorite things (in my extremely limited repertoire, I will add) to cook! OMGGGGG this looks perfect. I’ve had such a stuffy nose with allergies too and lemon seems like it would be the best medicine. Thank you for sharing!